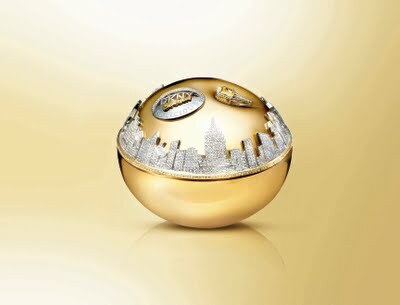 Remember this gorgeous Million Dollar Fragrance Bottle of DKNY Golden Delicious EDP? I did hope to take a glimpse of this in person but I guess it did not arrive our shores! BUT! Something better happened! I was able to do a "Cyber Interview" with Chanel Iman, the girl who unveiled the DKNY Million Dollar Bottle during the Press Event with body guards beside her to protect the bottle! How chic can protection get? To those who think Chanel Iman looks familiar! Well, I'm sure you've seen her either on Vanity Fair, Vogue or during the Victoria Secret 2011 Fashion Show! She's one of the VS Angels! I am not surprised DKNY chose her to be the face of the Million Dollar Fragrance! Here's my "not-so-formal" Q&A Portion! AMW: If you have your own DKNY Million Dollar Bottle, where will you keep it? Iman: That's a good question. I don't know what I'd do with my own million dollar fragrance bottle. I'd probably have it right next to my bed. That is a precious piece and Id want to keep it close to me. AMW: What's your "must spritz" DKNY fragrance when you go out on a date? Iman: I love DKNY Golden Delicious for the weekend. AMW: How does the Golden Delicious Fragrance fit in your lifestyle? Iman: All of the DKNY Delicious fragrances are definitely in my rotation. I like the DKNY Golden Delicious, but then I also like DKNY Be Delicious, it is good for the week and DKNY Golden Delicious for the weekend. AMW: How does it feel to be the face of the Be Delicious franchise? Iman: I've always wanted to represent DKNY. When I believe in a fragrance that I wear, I definitely want to be part of it. To be given the opportunity today, it's awesome. Chanel Iman, thank you for answering my short queries! I want to thank Theya So, of DKNY Philippines for helping me out on this! What would you ask Chanel Iman if you get the chance to talk to her? Pang international ka na talaga achie! Idol!! WOW! I am awed! Thanks for the post!